If you’ve walked passed us this morning – it may not look like it – but WE ARE OPEN TONIGHT!!! If you fancy seeing what’s happened since Saturday night, goodness gracious have we got a surprise for you! It’s amazing what a bit of paint can do – but seriously you should come and check it out. And the inaugural paint work is fittingly welcomed by the amazing Bronzehead. 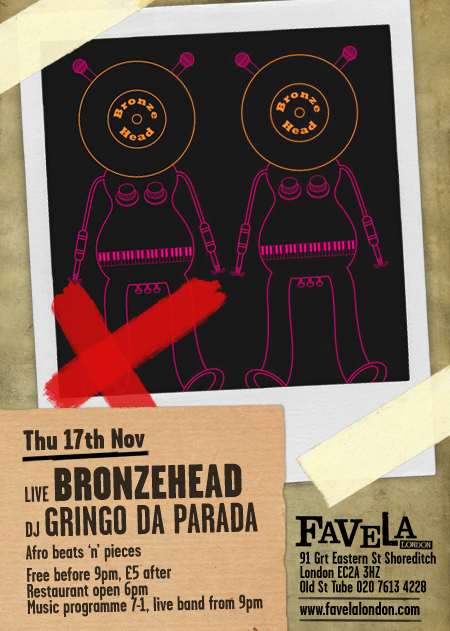 Their afro beats will move your feet and you will shimmy and shake till close with DJ Gringo da Parada on the decks. Only a fiver. Hold onto your hats London! Shocking as it may be, we’re open till 4am this Friday night! An extra 2 hours of serious party, and all thanks to our pals at Urban Nerds, who will be joining us this evening. Set to be one helluva shindig with DJ Deany Seagulls at the decks. 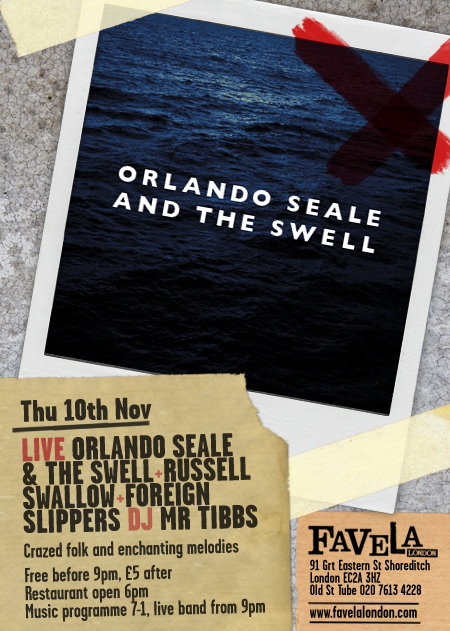 Tonight we’re happy to have Orlando Seale & the Swell celebrating their single launch at Favela! Joining him, Russell Swallow and Foreign Slippers. For a taster of a little to come, you can listen to a unique acoustic performance on the Stop Making Sense podcast over here. Pretty cool no? Look no further for evening plans London!!! Brazilian beats & a little English indie on the side please. 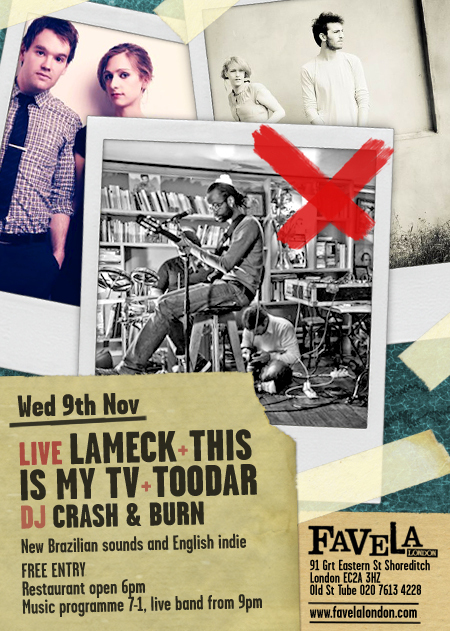 Tonight, we’re serving up a sunny bit of Brazilian tunage from Lameck with English indie pop on the side a la toodar and This Is My TV. Well take a listen below and why come out to Favela tonight? Well, heck. It’s free! Blues and Jam on toast. Tonight. The Dirty Gentlemen took over Favela for an afternoon of Gangster Love.